If there was one road trip that would invoke jealousy amongst the nation’s beer drinkers, it would have to be one that involved visiting the majority of craft breweries in the country. Two of New Zealand’s leading craft brewers have done exactly this. All with the hope of putting together a series of episodes that document the excitement, passion and flavour that the beers and brewers of this fine country have to offer. Luke Nicholas, president and founder of Epic Brewing Company in Auckland and new recruit, Kelly Ryan, who recently joined Epic after a successful brewing career with multi-award winning Thornbridge Brewery in the UK took up the challenge of visiting as many breweries as they could over a 17 day period. Film crew in tow, they travelled the country by camper van, covering almost 4500 kilometres as they documented the current craft beer scene. Visiting breweries, sampling beers, discussing brewery history and the passion that had resulted in people from all walks of life choosing brewing as their occupation, the pair’s progress was captured on camera to be used in an online video series. Coupled with the production was the idea that all of the passion and concepts of the craft brewers be captured in a special collaboration brew that was to act as a summary of what was happening in New Zealand beer in 2011. A grand total of 44 breweries from Invercargill to Auckland were included in the project, with a bunch of them turning up for the brew day at Steam Brewery in Auckland. 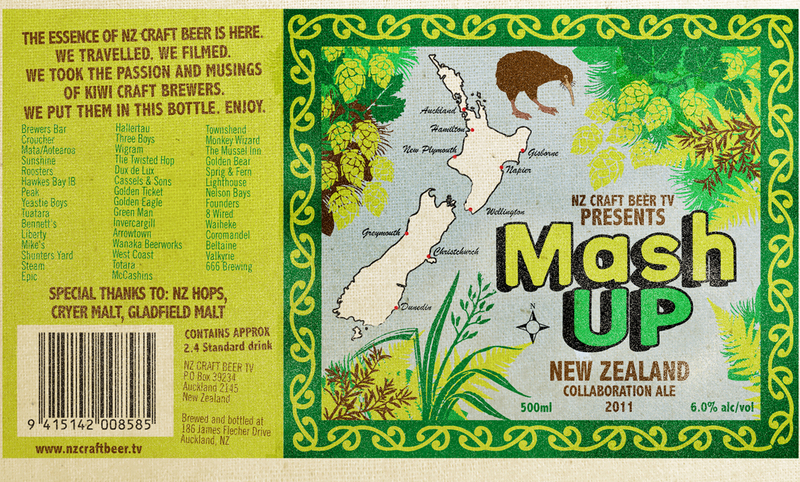 The resulting beer, Mash Up, is a New Zealand Pale Ale at 6% abv that is an ode to the deliciously refreshing New Zealand hops. It uses a blend of Kiwi and British malt (many brewers are British or got their inspiration from the UK beer scene) and is touted as being the world’s largest ever collaboration beer. “We thought of contacting the Guinness Book of World Records to get this verified, but didn’t want to give them too much press,” quips Nicholas. Nicholas and Ryan are no strangers to collaboration. Having worked on joint brews both at Thornbridge in the UK and here with Epic in New Zealand, they originally discussed the idea as guest international beer judges at the World Beer Cup in Chicago in 2010. “It sounded like an amazing concept and we hoped it would give others the chance to see how great the Kiwi brewing scene actually is,” says Nicholas. Let’s raise our glasses to that.